This article lists characters in the Splatoon series. Agent 3 - Inkling - Agent 3 is the playable avatar in Splatoon and the third agent of the Squidbeak Splatoon, assigned by Cap'n Cuttlefish. Agent 4 - Inkling - Agent 4 is the playable avatar in Splatoon 2 and the fourth agent of the Squidbeak Splatoon, assigned by Marie. Agent 8 - Octoling - Agent 8 is the main protagonist and playable avatar of the Octo Expansion DLC campaign for Splatoon 2. Callie - Inkling - One of the duo that comprises the Squid Sisters pop idol group and a host of Inkopolis News, along with her cousin Marie. Marie - Inkling - One of the duo that comprises the Squid Sisters pop idol group and a host of Inkopolis News, along with her cousin Callie. Pearl - Inkling - Pearl is one of the two members of Off the Hook, a band featured in Splatoon 2, along with Marina, that hosts their own television show, similar to the Squid Sisters from the first game. Marina - Octoling - Marina is one of two members of Off the Hook, a band featured in Splatoon 2, along with Pearl, that hosts their own television show, similar to the Squid Sisters from the first game. Cap'n Cuttlefish - Inkling - He is a decorated hero who fought in the Great Turf Wars of legend between the Inklings and Octarians. He now keeps solemn vigil over Octo Valley, watching for any fishy behavior. Though his clothes may be tattered, his heart is pure and nothing escapes his razor-sharp gaze. He also TOTALLY didn't write this post. C.Q. Cumber - Sea Cucumber - He is a translucent blue sea cucumber wearing a train conductor's hat. He appears to be the conductor of the Deepsea Metro. Judd - Cat - A cat preserved in time, long after the extinction of humans. He plays the role of referee in Multiplayer matches. Li'l Judd - Cat - A clone of Judd. He plays the role of co-referee alongside Judd. Mr. Grizz - Unknown - The boss of Grizzco Industries. He speaks through a fishing bear statue with a radio antenna attached to it. His true appearance remains unknown. Iso Padre - Giant Isopod - He is a giant isopod wearing sunglasses, a gold neck chain and a black leisure suit and carries a briefcase filled with toys. He also carries several childish accessories to further emphasize his playful side. Crusty Sean - Prawn - A prawn that owns the Shrimp Kicks store and has an easygoing personality. His jacket gives the impression of tempura. 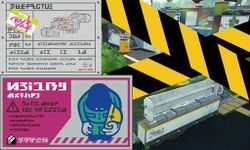 In Splatoon 2, he moves to Inkopolis Square and opens the Crust Bucket. Jelonzo - Jellyfish - A jellyfish that owns the Jelly Fresh store. He is one of the few known jellyfish able to communicate with Inklings, albeit poorly, as his dialogue is rendered in broken English. Annie - Sea Anemone - A sea anemone that owns the Cooler Heads store with a very shy personality. A clownfish named Moe lives in her tentacles. Due to getting too flustered greeting customers, she moves her shop online in Splatoon 2. Moe - Clownfish - An abrasive clownfish that slings insults at the customers of Cooler Heads at any given opportunity. Despite acting tough, he never leaves the safety of Annie's head. Sheldon - Horseshoe Crab - A horseshoe crab that runs the Ammo Knights shop in both Splatoon games. He is easily excited by the variety of weapons used in Turf War and is known to talk about them for a very long time. In Octo Canyon, he lends Agent 4 a variety of Hero weapons to use for specific levels. Spyke - Sea Urchin - A sea urchin that works in the back alley of Inkopolis Plaza. He allows players to order the gear of other players, albeit often for higher prices. In Splatoon 2, he has retired after making money through a get-rich-quick scheme. Bisk - Spider Crab - A spider crab that runs the Shella Fresh store and has a laidback personality. At one point, he broke up with his girlfriend to pursue a career in music. Jelfonzo - Jellyfish - A jellyfish that owns Ye Olde Cloth Shoppe, and the son of Jelonzo. He is also capable of speaking to Inklings, but due to studying ancient texts, his speech is very antiquated. Despite this, he always stays up to date with the freshest styles. Flow - Sea Slug - A sea slug that runs the Headspace store and has a very spacey and relaxed personality. Most Inklings seem to think of her as their "crazy aunt," and an emperor shrimp named Craymond lives on her head. Craymond - Emperor Shrimp - An emperor shrimp that lives on top of Flow's head. He has a very quick and anxious personality, in contrast to Flow, and frequently blurts out words when Flow finishes talking. Murch - Sea Urchin - A sea urchin that lets the player order others' gear and offers various other services to help players get the abilities they want. He is seen to look up to Spyke and appears to be following his get-rich-quick scheme. Some Octarians, ready to battle Inklings and protect the Zapfish. The Octarians are the main antagonistic species of the story mode in Splatoon. They reside in Octo Valley, and are responsible for stealing Zapfish from Inkopolis. Their main ink color is dark fuchsia. The Octarians fought against the Inklings for territory in the Great Turf War and lost. Unlike Inklings, the species includes a great number of sub-species that act differently from each other. Salmonids are a family of Salmon and Trout introduced in Splatoon 2's Salmon Run. They reside far off the coast from Inkopolis on man-made islands called "Spawning Areas". Like the Octarians, they have many different varieties. Inklings are a sentient race of squid-like humanoids who are the main playable species in the Splatoon universe. Octolings are the Octarian equivalent to Inkling, being octopus-like humanoids. Jellyfish can be seen scattered in Inkopolis Plaza and across various Stages. A species and type of currency in Splatoon and Splatoon 2. Their sole use is to increase the number of slots on gear or reroll all gear abilities on a select piece of gear. Creatures that appear in Splatoon's Octo Valley and Splatoon 2's Octo Canyon modes. The player must rescue one at the end of every level in order to proceed in the story. To take the Zapfish, the player must burst its shield with ink, like the Rainmaker's shield. Then they must touch it and the screen and music will change to say that they have passed the level. A bowing mole construction worker. Moles that act as construction workers. Sally and HARA WATARU, a pair of graffiti artists. Marie mentions having a friend who is a Blackbelly Skate. Marina mentions that one of her friends is a Sea Sponge. A handful of animals are seen and/or heard at various locations, including seagulls, sparrows, cicadas, and crickets. Unlike other creatures in Splatoon, many of which have evolved into more human-like forms, these animals seem to have changed very little over time. ↑ SplatoonJP on Twitter. Splatoon Japan (2015-07-27). Retrieved on 2015 July 27. This page has been accessed 388,174 times.